Blue Origin has so far signed up only commercial customers for its New Glenn rocket, but the company's new CEO said initial talks are underway about certifying it for U.S. government missions. 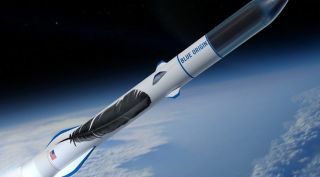 CHANTILLY, Va. — The new chief executive of Blue Origin told the National Space Council his company is in discussions about certifying its New Glenn rocket for government missions, a shift in strategy that could put the company in competition with a customer. In a presentation to the first meeting of the reconstituted National Space Council at the National Air and Space Museum's Udvar-Hazy Center here Oct. 5, Bob Smith said that the New Glenn rocket the company is developing could be used for both commercial and government missions, the latter requiring the company to go through a certification process with agencies like NASA and the U.S. Air Force. New Glenn, Blue Origin's first orbital launch vehicle, is designed to place up to 45 metric tons into low Earth orbit and 13 metric tons into geostationary transfer orbit. That is a larger capacity than the existing Atlas and Delta vehicles by United Launch Alliance, with the exception of the Delta 4 Heavy, which can place nearly 14 metric tons into geostationary transfer orbit. It's also bigger than SpaceX's Falcon 9, which, like the Atlas and Delta, is certified by the U.S. Air Force for military missions. To date, Blue Origin has focused on the commercial market for New Glenn. The company has so far signed up three customers, all developers of commercial communications satellites, for New Glenn. The company announced the third customer, Thai startup mu Space Corporation, Sept. 26 at the International Astronautical Congress (IAC) in Adelaide, Australia. New Glenn is powered by seven of its BE-4 engines in its first stage and one BE-4 engine in is second stage, with an optional third stage using the BE-3 engine first developed for its New Shepard suborbital vehicle. Blue Origin is also offering the BE-4 to ULA for its next-generation Vulcan rocket. Blue Origin executives, including founder Jeff Bezos, have suggested in the past that the company would not pursue national security missions, which are a cornerstone of ULA's business. "That is ULA's specialty," Bezos said of national security missions during a March 2016 media tour of Blue Origin's headquarters and manufacturing facility in Kent, Washington. "It may be very logical for ULA to continue to be specialized in doing that and we just support them with the engines." ULA has not yet made a formal decision on what engine to use in Vulcan, although the company has previously stated that the BE-4 is the leading contender versus Aerojet Rocketdyne's AR1. ULA Chief Executive Tory Bruno said in April that he was awaiting the outcome of tests of the BE-4 at Blue Origin's test site in West Texas before officially selecting the engine. Testing of the BE-4, though, has been delayed by a mishap in May that destroyed an engine powerpack, a key component of a rocket engine that includes the turbomachinery that pumps propellant through the engine. Smith indicated at the National Space Council meeting that those tests could begin in the near future. "We will soon begin testing our BE-4 engine, which will take New Glenn into space, and is being developed in partnership with United Launch Alliance," he said. Rob Meyerson, president of Blue Origin, said at the IAC last week that the company has made "measureable progress this year" on the BE-4, but did not elaborate. "We delivered the BE-4 hardware to our West Texas launch site for testing, and have more engines in the pipeline," he said in a presentation there where he announced the mu Space contract. Smith's testimony at the National Space Council meeting was his first major public appearance since becoming chief executive of Blue Origin. The company had not made a formal announcement regarding hiring him, although Smith joined Blue Origin in August, according to his profile on the professional networking site LinkedIn. "It's a great privilege to be part of an amazing team that is building reusable launch vehicles, modern powerful rocket engines and all the capabilities that will enable millions of people to live and work in space," Smith states in his LinkedIn profile. Smith previously worked at Honeywell Aerospace for more than a decade, most recently as president of mechanical systems and components. Before that, he was at United Space Alliance, the joint venture of Boeing and Lockheed Martin that managed space shuttle operations, where he was executive director of the company's space shuttle upgrades development program.